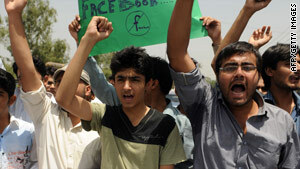 Pakistan Shuts Down Facebook because of "Draw Mohammed Day Protest" - They'll never get it will they? As a protest to Islam's rioting, protesting, [and sometimes murdering] after anyone creates a cartoon or characature of Mohammed, a brave facebooker created an event called "Draw Mohammed Day." What was Pakistan's response? Protesting and banning facebook indefinitely in their country. Can you say, irony? There were riots around the world in response to a series of cartoons of Mohammed in a Danish newspaper in 2005. (CNN) -- Pakistan is blocking access to Facebook in response to an online group calling on people to draw the Prophet Mohammed, officials said Wednesday. The Pakistan Telecommunication Authority issued the order a day before "Everybody Draw Mohammed Day," scheduled by a Facebook group with the same name. "Obviously (the blocking of Facebook) is related to the objectionable material that was placed on Facebook. That is why it is blocked," said Khoram Ali Mehran of the telecommunication authority. The organization has not received any complaints from internet users about the Facebook group, he said. Mimi Sulpovar, who started the Facebook group, said she read about the idea on a blog after Comedy Central bleeped out part of an episode of "South Park" that mentioned the prophet. "The majority of Muslims worldwide object to any representation of a prophet of God," he said. The idea of "Draw Mohammad Day" originated with a cartoonist who has since distanced herself from the idea, Sulpovar and Hooper said. "This extends beyond being able to draw Mohammad," she said. "If it's offensive to you, that's fine, but I don't feel it's right to impose your belief on others through intimidation. "Hate speech is wanting a group eradicated, physically harmed or dead. I dont think drawing Mohammed falls under that category," she said. figure in the world does not equal equality," she concluded. Facebook is investigating the block, said Debbie Frost, the company's director of global communications. Sulpovar's group and a similar one had attracted about 7,000 fans between them Wednesday. Groups opposing the idea had about 68,000. Idol worship. BAH! You're already worshiping an idol even if you keep him invisible. The ME Islamic world deserves all the ridicule it's getting.